FIXTURE RELEASED… Brad Edwards (Kyabram) goes for a kick in round three of the GVL 2018 season. Photo: Bailey Opie Photography. THE official 2019 GOTAFE Goulburn Valley League fixture was released on Monday night, with clubs again given the chance to negotiate time and day changes to the fixture. For the 2019 season, there will be six night games in the first four rounds, including the regular night game between Shepparton and Shepparton United on Good Friday. 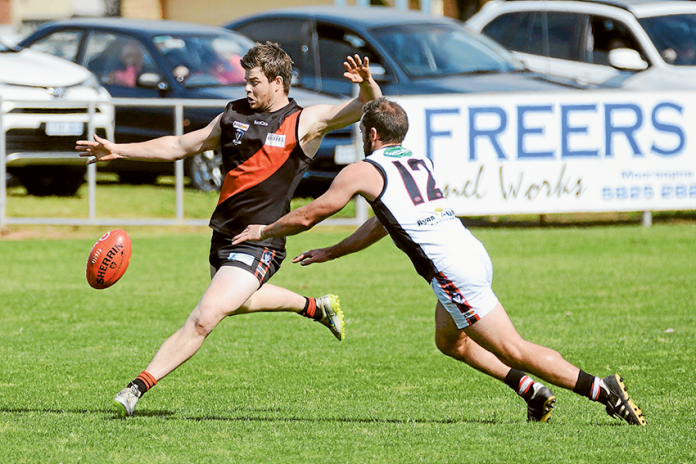 There will also be a second Good Friday game this year, with Benalla taking on Seymour during the day. 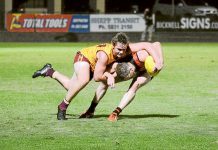 There will be a split round in early August for round 16 and general byes on the weekends of May 18 and July 13 for the Community Championships and the Vic Country games, respectively. GOTAFE Goulburn Valley League chairman, David Roff said, “The negotiated fixture changes result in a healthy balance for all. To attain a copy of the 2019 GOTAFE Goulburn Valley League, visit www.gvleague.com.au or check out GV League on Facebook and Twitter.